Alice in Wonderland hand painted chess set. Tim Burton, Helena Bonham Carter, and kids at Disneyland. Not sure what this is. It's a comic book adaption of some sort: John Cassaday's "The Complete Alice In Wonderland" with a cover on which Alice looks kind of like a 16 year old boy. 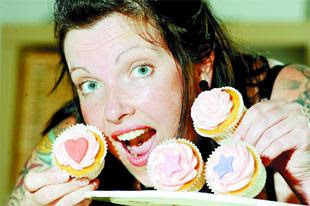 Last, and most importantly, this woman, Melinda Foster of Rawtenstall, won a national cupcake contest in the U.K. with her Alice in Wonderland themed cupcakes. The winning cupcake? The White Rabbit. Awesome!